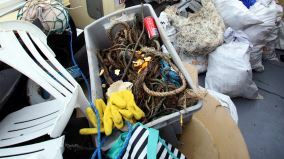 Marine debris collected on the island and beaches around Great Keppel Island. Keppel Island Conservation Community received $15,000 in Everyone’s Environment Grant funding to undertake marine debris clean up on the islands and beaches around Great Keppel Island. To date the project has undertaken 11 beach clean ups, removing two and a half skips worth of marine debris. A total of 335 volunteers have been involved in the project and, once again, the organisation has had to turn volunteers away. With litter and marine debris an ongoing problem, the organisation has taken the opportunity to work with other environmental groups in the area to provide information regarding catchment care to the volunteers taking part in the clean-up operations to help reduce the amount of marine debris affecting the islands.